Last year, the FDA issued a landmark approval for the immune therapy drug pembrolizumab (Keytruda) for the treatment of adult and pediatric metastatic tumors whose cells have defects in their DNA repair machinery. This was the first-ever approval of a site-agnostic drug, which targets a tumor based on its genetic profile instead of its anatomic location. The big picture: The carpet-bombing approach of chemotherapy is slowly giving way to targeted therapies, which use drugs to attack specific abnormal molecules in cancer cells. Because these rogue molecules result from genetic mutations, sequencing the genes of a patient's tumor can determine which targeted therapy to pursue — an example of the personalized approach to treatment known as precision medicine. The background: Cancer results from the accumulation of genetic mutations that endow normal cells with malignant properties. The constellation of genetic mutations varies greatly between cancers, precluding a one-size-fits-all treatment approach. Precision medicine will be especially helpful to patients whose cancers did not respond to previous treatments but can be matched with an approved targeted therapy. It will also make it easier for doctors to profile tumors and confirm pathological diagnoses. Since cancer is a disease of genes, DNA sequencing of both healthy and tumorous cells can improve patient management by directing the use of specific, gene-targeted drugs. It may also reveal inherited cancer predisposition mutations that can inform family members of their cancer risk and screening strategy. One fourth of all cancers are inaccurately diagnosed and staged. An accurate pathological diagnosis is essential in dictating the treatment strategy for the patient, which might take advantage of precision medicine. “Liquid biopsies” that assess tumor DNA in the blood may replace the need for tissue biopsies in some patients. Profiling may be expanded to include the immune cells in a tumor and the microbiome in the gut to more precisely guide the use of specific immune therapies. Additional site-agnostic treatments like Keytruda will be developed. Yes, but: Only a minority of cancer cases possess actionable mutations for which precision medicine will be able to improve overall survival. Moreover, the presence of an actionable mutation does not necessarily ensure that patients will benefit from a targeted therapy, incurring potential drug side effects and increased financial stress for our patients. This underscores the need for continued research. The bottom line: While there’s still no magic bullet for cancer, precision medicine will save lives and must be the standard of care. 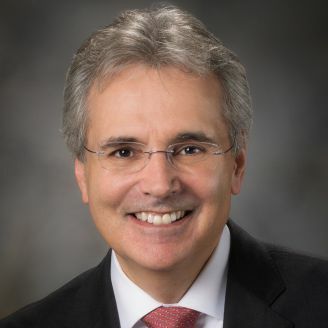 Ronald DePinho is a professor and past president of the University of Texas MD Anderson Cancer Center. He is founder and director of Tvardi Therapeutics, which is developing a targeted therapy for STAT3 in cancer and non-cancer indications.